So, if your on schedule, you would have your Quilt top finished!! Hooray!! .. I think backings have come a long way over the last couple years... When i made my first few quilts... you kind of just put anything on the back. No one really took much consideration.. They would say 'Oh, Its just the back!!".... But now... The back is just as important as the front! You can have a whole piece of fabric, or you can have a pieced back. For me, I think it depends on the quilt whether I piece the back or use the one fabric. Look at your Design... Do you think a pieced back would add to or take away from the front?? I really like the back to tie into the front and not just be a random piece of fabric. The next thing I do is I measure. Depending on the measurements of the Quilt, I decide if a pieced back would work. Lay your quilt top down... Measure the length and the width. When i measure my quilt top, if it is close to 44" in width then i usually piece it. This will help you decide whether you need to add width to your quilt top?? Or do you need to add length?? 2) Sometimes you can buy backing fabric that is extra wide so you dont need to buy double width. This can save you money. 3) Pieced Back... Knowing my Quilt is 50" x 58"... Its close to 44"... Im going to do a pieced back. I had 68 inches (170cm) of fabric. You need 64". Its only 44 inches wide, so its long enough to cover the quilt length, but not wide enough to cover. So I chose this design for the back of the quilt. This will give me an extra 12 Inches in width.. making the backing piece 56" wide. It will now be wide enough to cover the width of the quilt with those few extra inches on the side that make life so much easier for next steps in completing your Quilt. If your following along and want to make a pieced back the same as mine...., Take your black and white fabric and cut sixteen black, 5" x 5" squares, and sixteen White. Sew these squares together like we did in Class 5 to make 32 HST (half Square triangles). Cut 3 strips of white fabric, 2 1/2" wide selvage to selvage. Take one of these strips and cut in half. Join the two cut pieces to the remaining two strips to make 2 long strips measuring 64" each. Following the picture above, Sew the two long white strips on either side of your zigzag. Flip it over so you can measure and cut a strip 11" wide. If your fabric is like mine and its directional... Keep that in mind when your cutting. Your pieced back is ready for your next class..... Basting!! It can be a little tricky trying to decide how to piece your back.... You can find tons of Inspiration of .Flickr I even found a Flickr group called Quilt Backs full of pictures of the back of Quilts... Its fun to browse through Flickr for inspiration. You are all so so clever!! 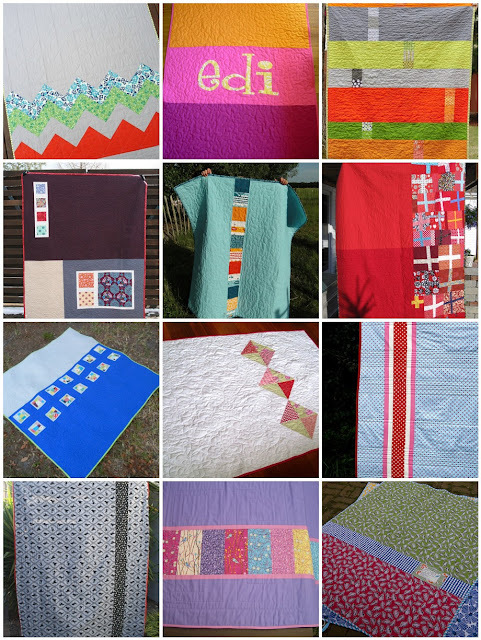 Welcome to all of you who are new to following along with Quilt Class 101... You can find all the previous classes HERE. Also, if you have a tutorial on your blog related to one of our classes.. You can still link up with each class HERE. Mr Linky for this Week..... Show us your backs!! I would love for you to share some of your Quilt Backs with us....??? Link up below!! It doesnt have to be a new post.. You might want to link to an old post that shows a picture of the back of your quilt. If you have done a few pieced Quilt backs.. You might want to link up a new post full of pictures of all your pieced backs for us to look at! Oh I just ordered a tonne of this fabric in green for a quilt backing! Now I know how good it will look I am thrilled! looking forward to seeing everyones quilts and what colours they went with, sorry I didn't get a chance to make one as well! I fell behind because of work, but still following and learning - thanks! I did not get in on this quilt project, too much to do. Love the quilt though, fun, bright, cheery for one and all. Have super great sewing and stitching day. This is a great post, with all the backings!! Thank you for all the inspiration! Your backings and the others are so inspiring and that way I work on destashing so I can buy more fabric! Thanks so much - here from Vicki's blog. I ordered my fabric last week in a sale - I ordered a selection of fabrics from Amy Butler's Daisy Chain range as they were on sale. Unfortunately the White was out of stock so I'm a bit delayed. also, you said that if the width is close to 44" wide, you'll do a pieced back - is this because fabric is usually 44" wide and you won't be able to use one piece of fabric? Thanks! How I'm Quilting my QC Quilt. More on Batting... with Amy. FROLIC : play and move about cheerfully, excitedly, or energetically.